Here on the East Coast the days are getting shorter and the skies, darker. Unless I want to sleep all day, I need to push myself to get outside when it’s sunny — and inside, to expose myself to colors that energize. Thankfully, readers keep sending me photos of their kitchens and bathrooms and other rooms infused with happy. With their exciting pops of red, these 11 kitchens sure do keep me alert, and smiling. 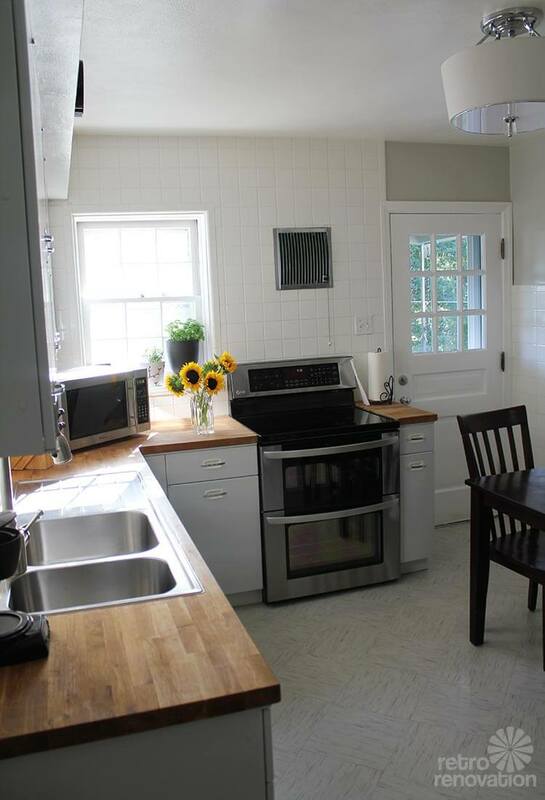 Lauryn and Dennis’ remodeled Iowa kitchen is just so darn sweet. Notice the downsized refrigerator — Lauryn says stuff still gets lost in the back, hehe. See 20 more photos of this kitchen, courtesy Radim Schreiber. Above: Just this morning, we featured 23 photos of JoAnn and Mark’s stunning 1930s-meets-1950s-meets-2012 kitchen remodel. 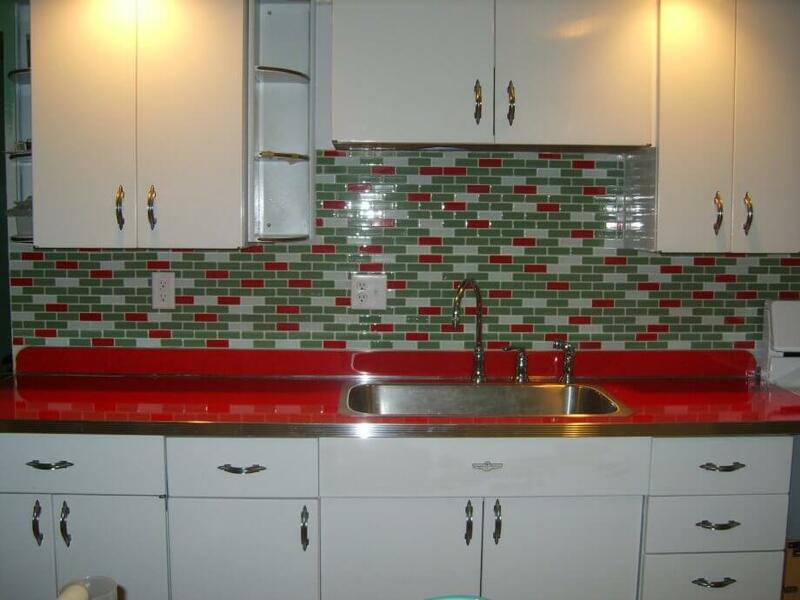 The pops of red are what make this kitchen… well… pop! 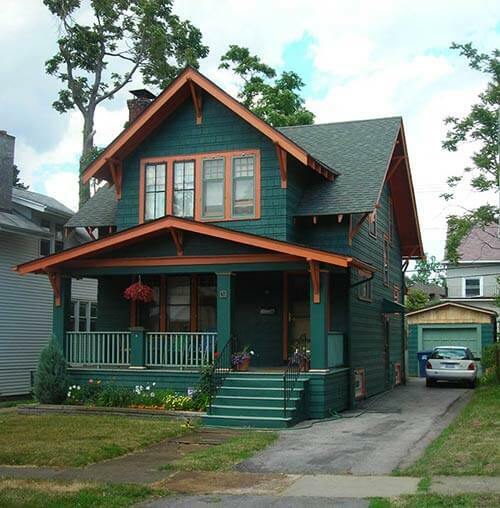 Yes yes yes: How much time do you want to have to work to pay for a house and all its demands? This is a life decision with serious life consequences. Above: We showed David’s sunny old fashioned kitchen. Those red gingham cafe curtains are so wonderful. 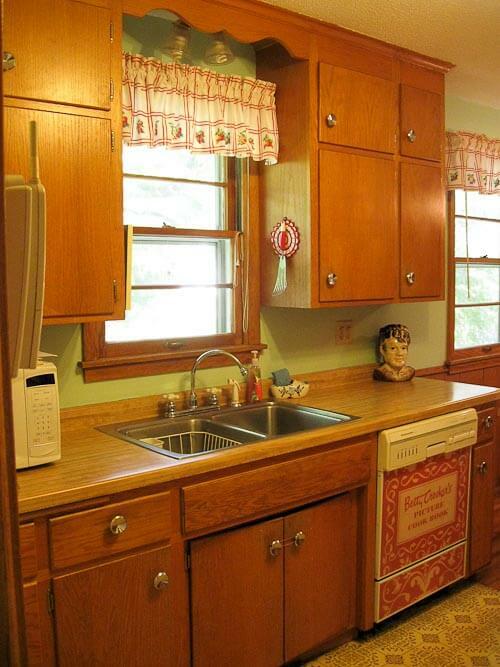 This kitchen went a little viral on our Retro Renovation Facebook page. 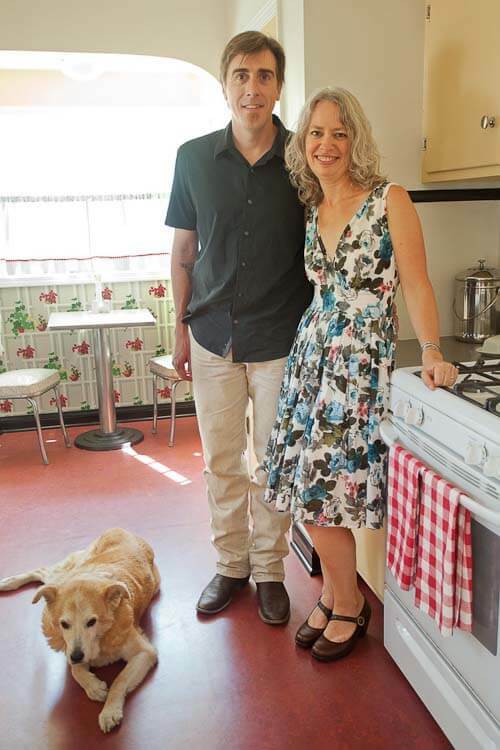 Above: Greg and Tammy gave their 1980s kitchen a retro country look, mostly with paint and decoration. 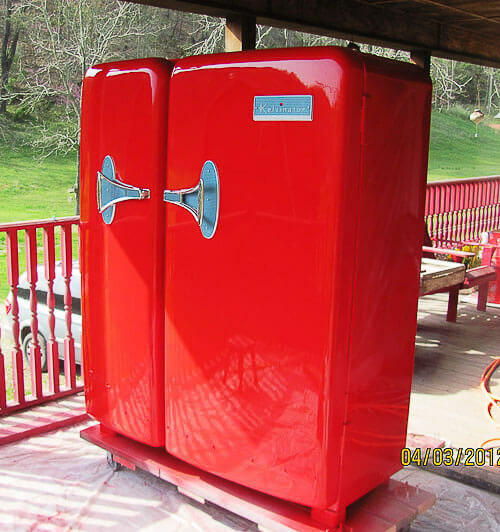 Oh, and everyone loves that big red Kelvinator refrigertor, for sure! 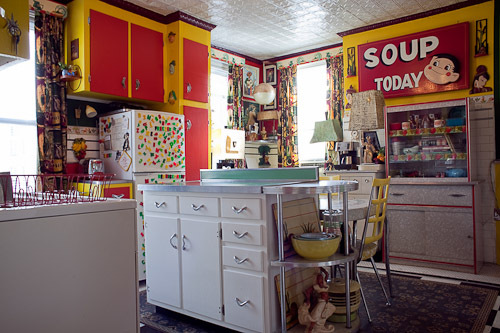 Above: I am declaring that red is the lead color in the kitchen of Cullen Meyer, the Crown Prince of Kitsch. 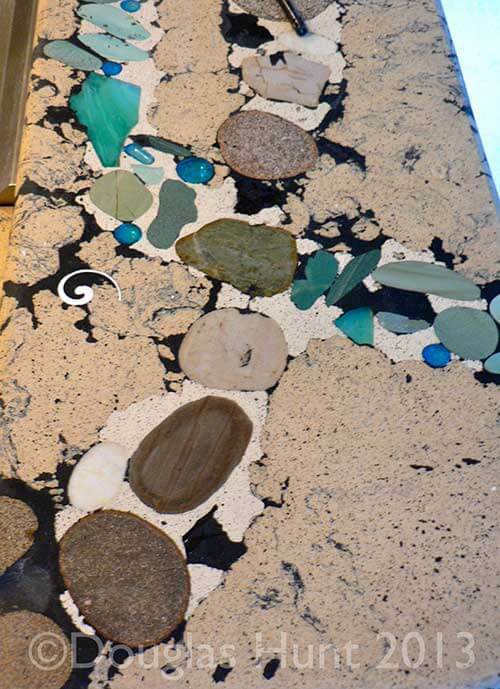 Did you see Kathy’s instructions on how to make your own custom dishwasher panel. 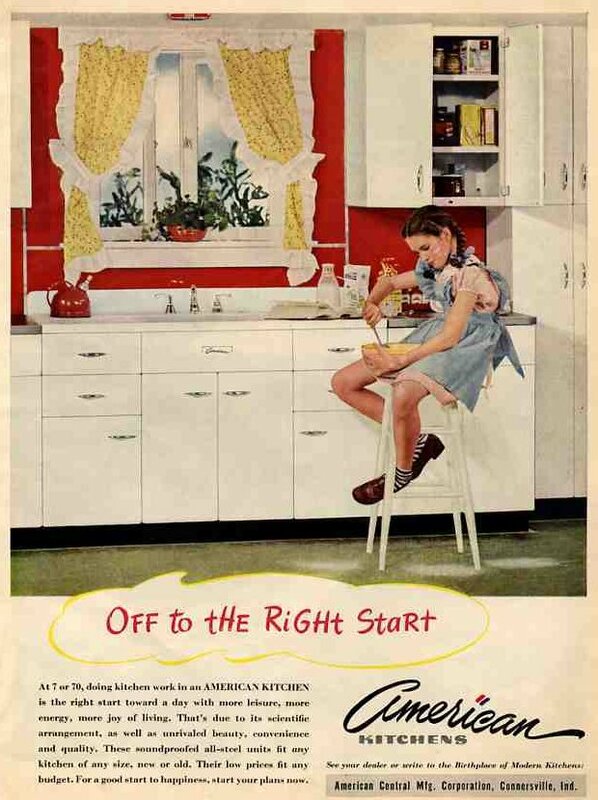 Her kitchen has a history related to the Betty Crocker test kitchen so she used this image — I love it. 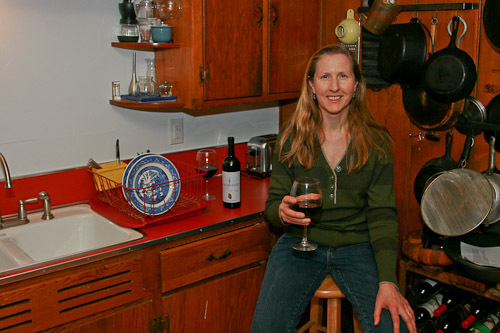 Kathy has red touches throughout her kitchen. 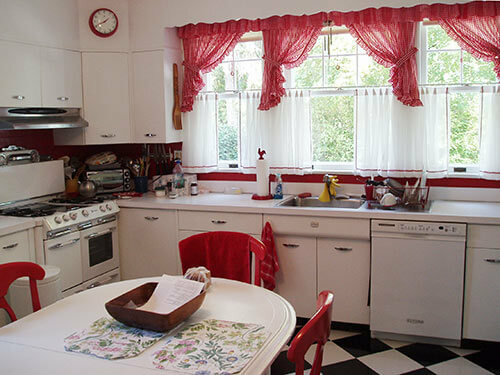 Susan, too, gets props for the energetic dose o’ red in her vintage kitchen remodel. 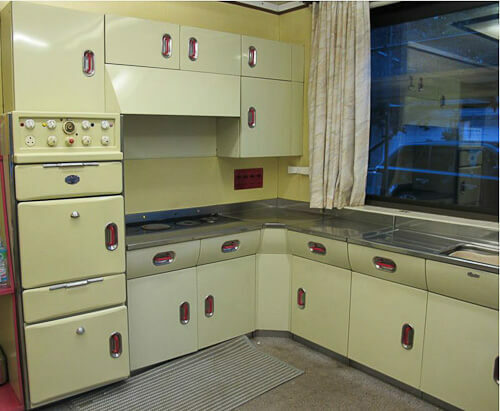 And for our archive, here’s a vintage kitchen from the U.K. — English Rose brand steel kitchen cabinets with a Revo oven. It was for sale on ebay, but it looks like it didn’t sell. You can buy reproductions of English Rose cabinets today from John Lewis, I don’t even want to guess how pricey they are. 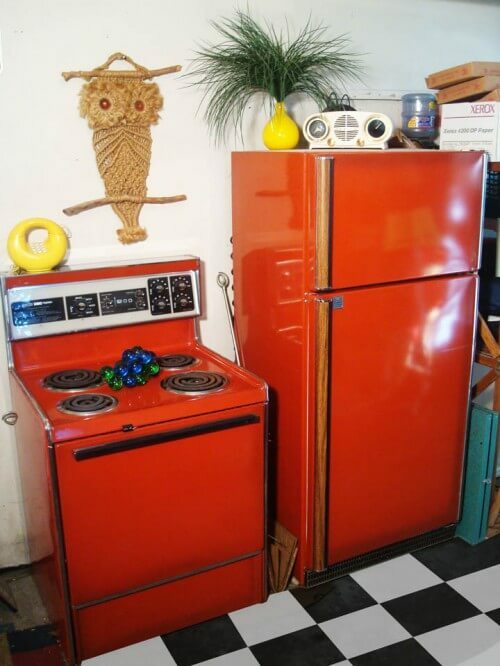 Circa-1975 poppy red stove and refrigerator and other kitchen appliances — yowza. I love these. But the American public did not. 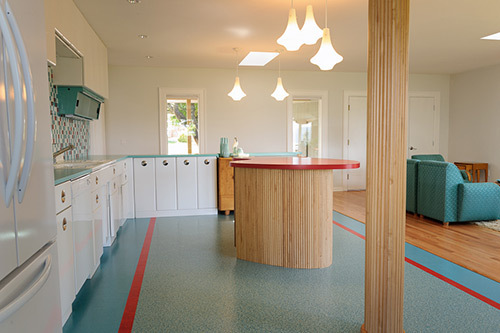 I love the floor color in the first kitchen. We recently stained the concrete floor in our living room almost the same color. I know it’s not red, but the set designers for the latest season of “Big Brother” here in Australia have created an amazing 1950s style kitchen! A few other areas inside the house are very 70s retro, particularly the lime and avocado bathroom, and the outside of the house is classic 50s Australian. You can probably Google for more images and video. 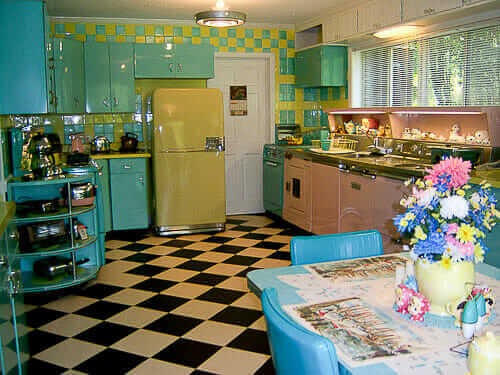 Kudos to the designers and set dressers here, perhaps more people will be inspired to keep their vintage kitchens! Wow! I love that kitchen, thanks for sharing! 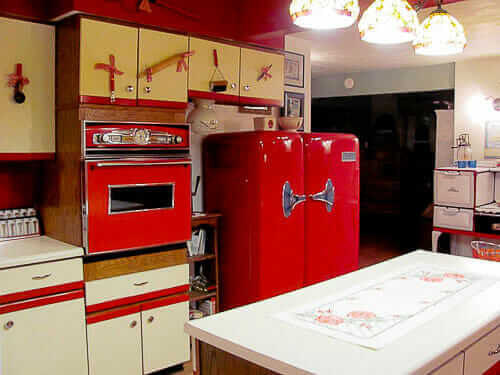 I love red kitchens, too! o my gosh i love these kitchens. the use of color and imagination is so amazing. it takes me back to time when i would eat captai crunch at my grandmothers tabel.love those memories. Red kitchen are my favorite! My grandma had the best 1940’s post-war red kitchen and that is where I fell in love with them.